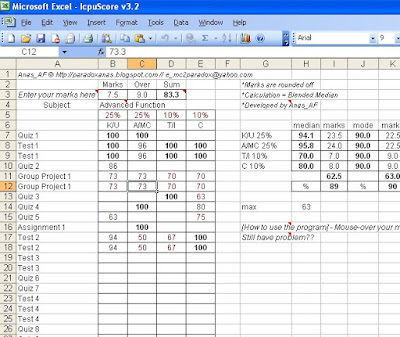 Anas Faris: icpuScore - we calculate your marks! u'v designed ur own software? n all d best for finals. ooohh..next time will have a better guide..next sem pny new edition..
good idea, barulah junior2 sume ade semangat skit nak study erk, hehe..
Hafiz: yeah2, harapnye mcm tuh la. Awak punyer icpuScore tu awak edarkan ke? owh... utk aku tak free la ni? 2 Shahro: untuk ko percuma. where exctly cn i get ths software u created? ?